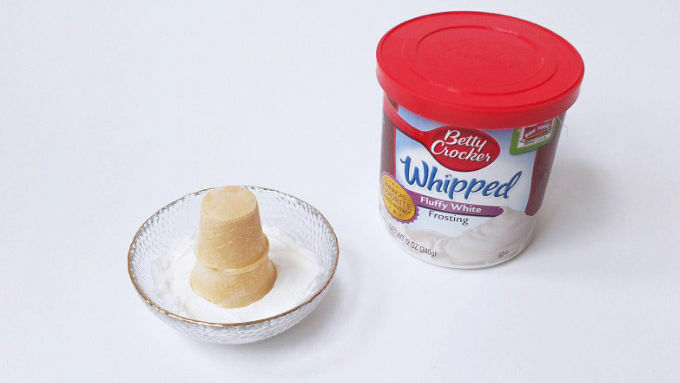 Place half of the frosting in a shallow dish. 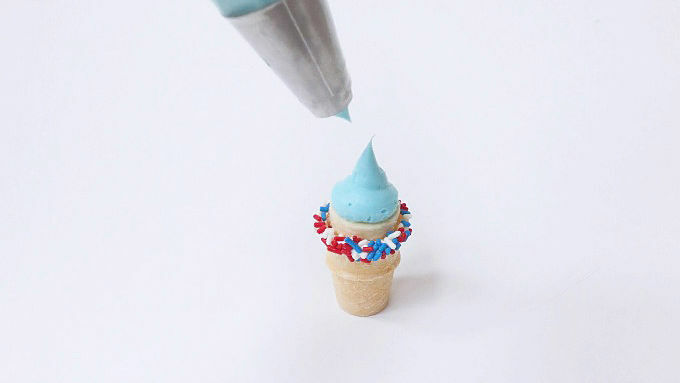 Turn the mini ice cream cone upside down into the frosting, coating the rim of the cone only. Put the jimmies into a small dish. Dip the frosted rim into the jimmies until the frosting is completely covered in sprinkles. 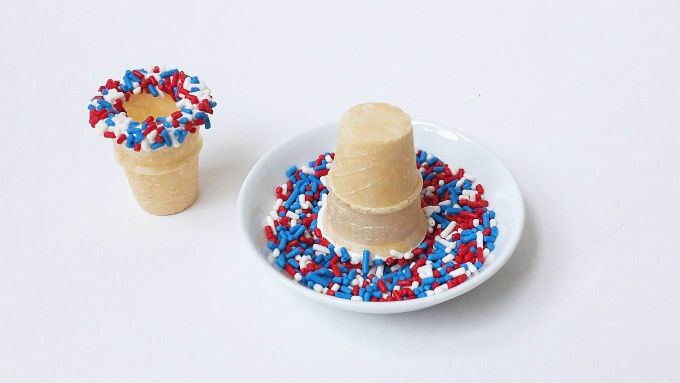 Fill the mini ice cream cones with yogurt. Cut the banana into 2-inch slices. Place banana slice into the cone. Tint the remaining frosting with blue food coloring. Pipe frosting onto the top of the banana. 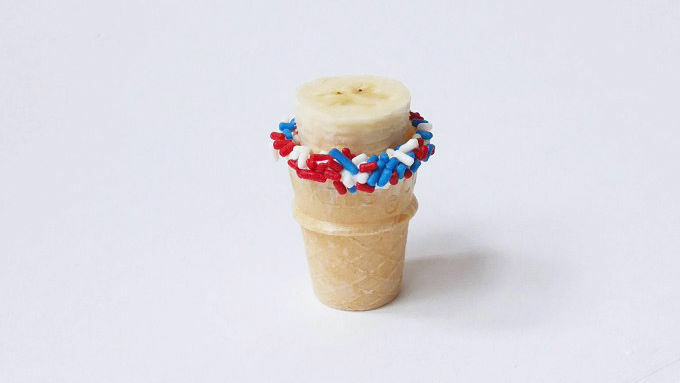 Sprinkle the red, white and blue jimmies on top of the frosted banana. 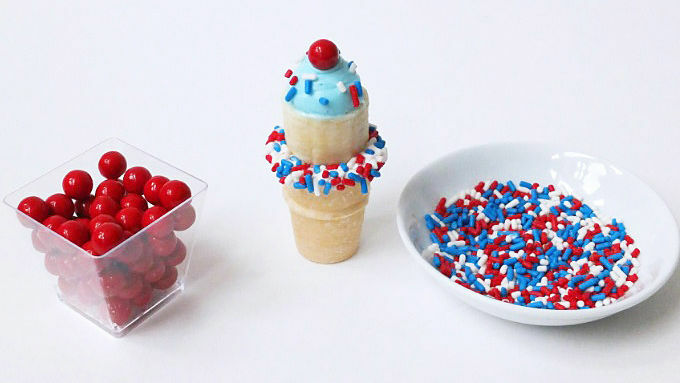 Top the frosted banana with a Red Sixlets™ candy. To keep the cones from getting soggy from the yogurt, you can coat the insides with melted chocolate and let dry before filling with the yogurt. Sprinkle the banana slices with lemon juice to keep from browning. Dry the tops of the banana slices with a paper towel so the frosting doesn't slide off. 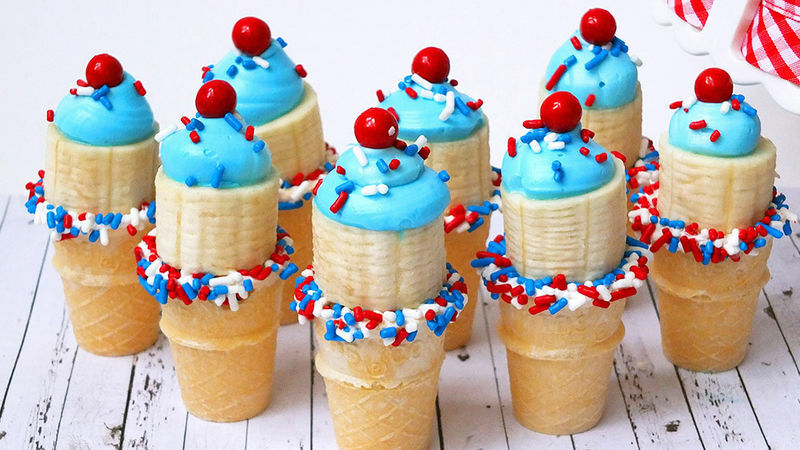 These cute-as-can-be mini cones are no-melt, bite-sized version of a banana split! I’m all about the food on the 4th of July, but coming up with desserts that won’t melt in the summer heat can be a little challenging. Everyone seems to be craving ice cream sweets! Like banana splits. Which just happens to be one of my all-time faves. So I came up with a no-melt, no-mess, super cute split, all patriotic and mini. A mini banana split in a cone. A CONE. Yeah, I’m kinda patting myself on the back here. And the cone is filled with… wait for it…Yogurt! Cool, smooth, refreshing strawberry yogurt. It’s like liquid ice cream. Mmmm. You can use any flavor, but I wanted my cones to have that banana split flavor so I went with strawberry. 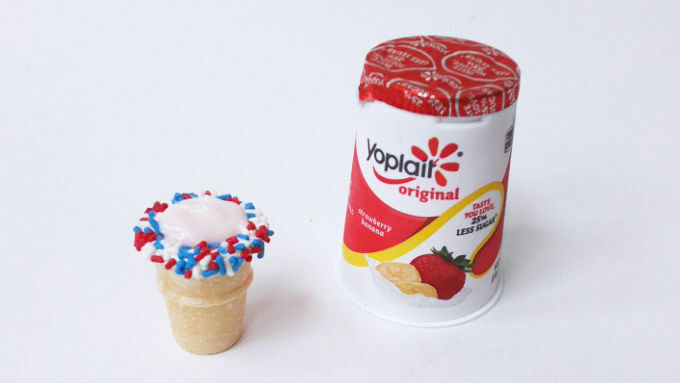 The strawberry Yoplait™ Yogurt, the creamy vanilla frosting, the chocolate Sixlet™ candy and the banana all make up the perfect banana split bite in an adorable mini ice cream cone It’s bursting with star spangled sweetness for your 4th of July bash!